A Tuesday night quickie at Canton Noodle House in Burwood. 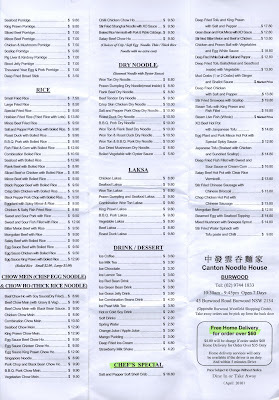 Canton Noodle House is a buzzy no frills Cantonese joint on Burwood Road. It is packed on a humdrum Tuesday night, we counted only two spare tables out of thirty, while the rest of Burwood is near empty. We've obviously stumbled upon a long-running local institution. 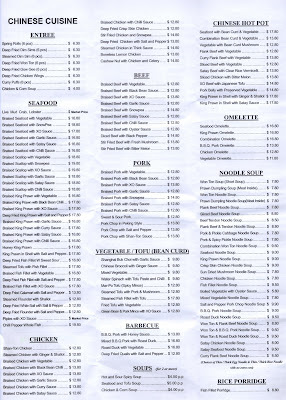 It's cheap, the service is friendly, and the menu has loads of choices beyond your standard suburban Cantonese joint. Joy. Steamed Cockles - $10 for 4. With ginger and shallots, fresh and rustic. BBQ Pork Dry Noodle - $10. BBQ pork is always good. The egg noodles are a nice alternative to rice. Steamed Egg with Seafood Topping - $14.80. A random punt from the Chef's Specials. There's prawns, mushrooms, scallops, fish and greens in a comforting plain sauce of thickened chicken stock. Underneath is a layer steamed egg, like a savoury custard set into the bottom of the glass bowl, the texture is divine. It's a plain dish that was just to our liking after the artery clogging fried soft bone chicken at ATL Maranatha the night before. 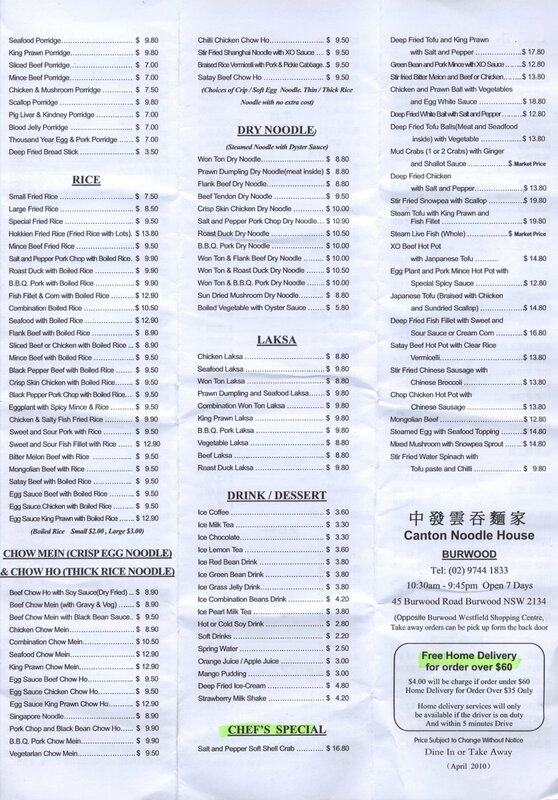 Canton Noodle House is at 45 Burwood Road, Burwood, opposite Burwood Westfield Shopping Centre. Open 7 days 10.30am - 9.45 pm. The last dish goes so well with rice! 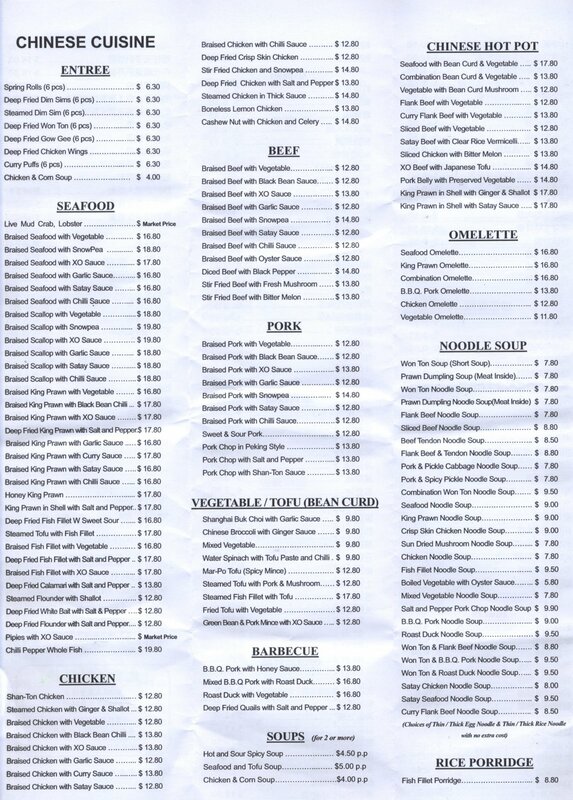 Love Canton Noodle House. Always good for a quick feed pre- or -post movie! The steamed egg dish looks really nice. I love the deep fried tofu balls here. Hey Dumpling Girl - those deep fried tofu balls looked popular, more than one table had them, we wanted to order them but weren't in the mood for fried stuff - next time! It's a testament to the restaurant if it's packed on a weekday. The local Asian community must really be packing the place in! But to its credit, I have stayed in Burwood a while, there really isn't very many other places with the same quality as this restaurant has.